Previously: Part One, Part Two, Part Three. It takes a special audacity to try to illustrate The Picture of Dorian Gray. First, you have to capture Wilde’s image of idealized, youthful beauty. Second, you have to portray the picture itself, and the hideous corruption that it reveals. And somehow you have to retain the sense of identity — the idea that it is the same picture changing over time, and that it, and that other figure, the flesh and blood Adonis, represent the same person. In the best case, too, the adaptation should embody the principles of Wilde’s theory of representation — that art is greater than life, that imagination is more perfect than reality. And finally, the style of the depiction should retain something of the feel of the period, even if it does not slavishly conform to Wilde’s own tastes. An exclamation of horror broke from the painter’s lips as he saw in the dim light the hideous face on the canvas grinning at him. There was something in its expression that filled him with disgust and loathing. Good heavens! It was Dorian Gray’s own face that he was looking at! The horror, whatever it was, had not yet entirely spoiled that marvelous beauty. There was still some gold in the thinning hair and some scarlet on the sensual mouth. The sodden eyes had kept something of the loveliness of their blue, the noble curves had not yet completely passed away from chiseled nostrils and from plastic throat. Yes, it was Dorian himself. . . . He held the light up again to the canvas, and examined it. The surface seemed to be quite undisturbed, and as he had left it. It was from within, apparently, that the foulness and horror had come. Through some strange quickening of inner life the leprosies of sin were slowly eating the thing away. The rotting of a corpse in a watery grave was not so fearful. It is hard for a cartoon to live up to this description. The Marvel version of Dorian’s picture looks wicked in a comic-book super-villain kind of way. But there is nothing horrific in its appearance. It looks bad, unhealthy, ugly, perhaps a little demonic. But there is nothing in its appearance to convey the tragedy of what Dorian has become. Of course it is not only comics that have faced such difficulties. Dorian’s image has appeared on the cover of several editions of the book, in illustrations inside the books, and occasionally in movies. The original Lippincott’s serialization carried no illustration at all. When the novel was published in a single volume, Charles Ricketts designed the title page and the cover, for both the small-paper and large-paper editions. The design did not feature any representation of Dorian himself, showing stylized daisies instead. Since then, cover designers have tried any number of approaches: The 1993 Everyman volume uses a detail from John Singer Sargent’s portrait of W. Graham Robertson. It shows a very young man, an adolescent. He is well-dressed, but in dark clothes. He is pale and handsome, standing before a dark, indistinct background. It is his youth, not his beauty, that stands out. The 2003 Penguin Classics also uses a detail from Sargent, this one from his Earl of Dalhousie. It shows a handsome young man in a white suit, posing by some columns. He wears an arrogant expression. The 1994 Wordsworth Classics edition features the Pre-Raphaelite artist Anthony Frederick Augustus Sandys’ Portrait of a Gentleman. The gentleman in question is fresh-faced, wearing a natty jacket with a flower in his buttonhole. The pose is casual. The Barnes and Noble Classics of 2003 uses Henri Lehmann’s Portrait of Franz Liszt. It shows a very young man with sharp features and large, hard eyes. He stands before an empty dark gray background. Turned sideways, his arms crossed, he looks at the viewer. The standard formula is clear enough, but there are variations, some quite inventive. 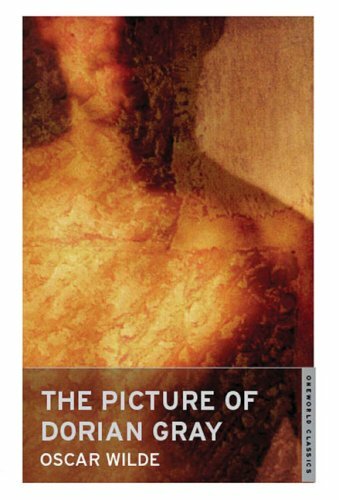 The Dover Thrift Edition (1993) offers a blurry, impressionistic detail of a young man with dark hair and eyes. He practically fades into the black background. But he is, alas, not a striking beauty. The cover of the Oneworld Classics edition (2008) employs a photo by Richard Jenkins. It shows an unusually masculine young man, visible only cheekbones to waist. It is done in yellows and reds, giving it the appearance of an old, water-damaged photograph. The image produces surprising depth, with an impressionistic, painterly effect. More abstract, Gabrielle Bordwin’s design for the Modern Library Classics (2004) uses a close-up on an eye and a lock of hair. Signet Classics (2007) presents a partial portrait, framed by a half-circle and suspended without context. One dark eye looks at us. A little auburn hair is visible. The face is purely androgynous. It is, apparently, a detail from Agnolo Bronzino’s 16th-century painting Portrait of a Young Man. As a design, it succeeds almost perfectly. The bold abstraction, the sexual ambiguity, the pure beauty of the image and the timeless quality of the portrait — not to mention the title — all serve Wilde’s purposes. All of these images share an important feature: They show one figure, Dorian or his portrait. There are far fewer that show both together. This entry was posted on Thursday, May 20th, 2010 at 12:01 am	and is filed under Blog, Essay, History.